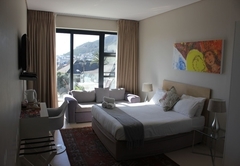 Grande Kloof Boutique Hotel is a highly recommended Fresnaye boutique hotel providing accommodation in 27 guest rooms for tourists visiting the Atlantic Seaboard region. 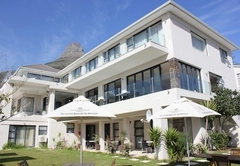 Positioned against the backdrop of Lion’s Head, overlooking the Atlantic Ocean and Robben Island, Grande Kloof Boutique Hotel is the perfect luxury destination offering tranquillity in a relaxed environment - the newest ‘best place to be’. 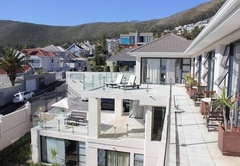 Grande Kloof is located on Kloof Road in Fresnaye - one of Cape Town’s most fashionable and prestigious residential areas with breathtaking views. 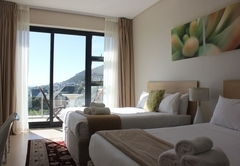 Guests to the elegant Grande Kloof Boutique Hotel can choose from a variety of beautiful rooms: romantic Top Floor Suites for stunning sea views and a touch of extra luxury; Open Plan sea view rooms; and Petite Garden Rooms with easy access to the pool and wellness area. All these lovely, immaculate bedrooms include King and Queen-size beds (Top-floor Suites), or Queen-size beds (Petite garden rooms), luxury amenities, such as satellite TV, free wireless, mini bar, digital safe, as well as bath / shower options, and hair-dryer. 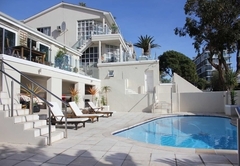 Lounge around the outdoor swimming pool or head down to the beautiful beaches of Clifton and Camps Bay which are literally down the road. 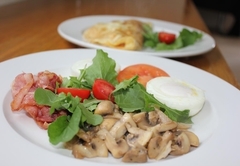 We offer a light continental breakfast - Sit in our breakfast dining room and enjoy our fresh breads, fruits salad, cold meats, home-made jams, Swiss muesli, orange juice, coffee and a selection of teas, fried, scrambled or boiled eggs and bacon. 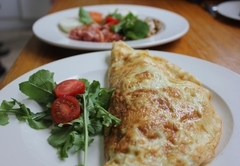 A nice selection to start your day. 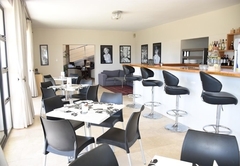 Relax in our tastefully decorated lounge and luxury bar area. Soft neutral colour palettes and under tones create a sense of elegant, sophisticated charm and tranquillity. The lounge has WiFi and is the perfect place to relax and send of those necessary emails. 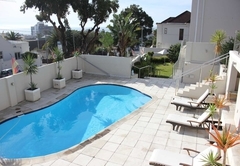 The large top floor patio offers a sunbathing area furnished with sun beds and umbrellas. 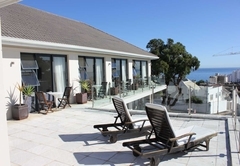 From here our guests can enjoy breathtaking views of the ocean and Robben Island. 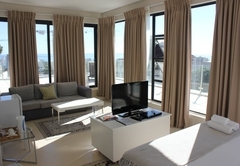 The Garden Suites have their own lounge area which leads out onto the large garden with sun deck loungers and umbrellas. 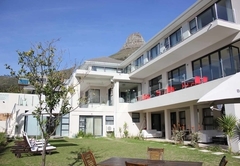 Grande Kloof is within walking distance of Sea Point and Bantry Bay many trendy and fashionable restaurants and cafés on the Platinum Mile and is just a short bus or taxi ride to Cape Town’s well known Victoria and Alfred Waterfront. Petite Garden Rooms (101, 102, 103, 104); Garden Facing Room with additional separate entrance leading onto patio. Modern Open Plan Bathroom to bedroom concept (separated by frosted glass); Queen sized beds, mini fridges, and all rooms air-conditioned. 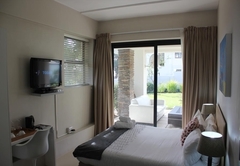 Luxurious family unit (non-smoking); 2 queen sized beds in an open plan area, 2 bathrooms with showers (the first shower is on-suite to the main bedroom area.1 modern lounge with flat screen TV, DSTV, DVD player, digital safe and hairdryers. 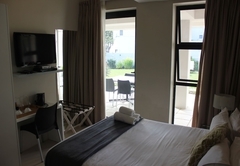 Deluxe rooms with sea-views and has a queen size bed, with a remote control flat sceen tv, MNET / DSTV, DVD player and digital safes. Open Plan Bathroom to bedroom concept, with a Shower and Bath. 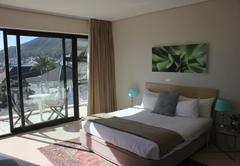 Deluxe rooms with sea-views and has 2 queen size beds, with a remote control flat sceen tv, MNET / DSTV, DVD player and digital safes. Shower and Bath. Located on our main floor, this room is a standard, budget room. 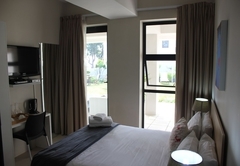 With queen bed, Tea & coffee station, on suite bathroom with basen, shower, and toilet.mini bar, TV, DSTV, air-conditioner. Beautiful overall sea facing view of the entire Guest House. 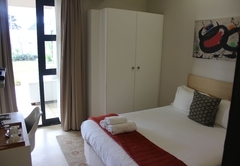 Dormitory private twin-bedded backpackers option has 5 rooms with 2 single beds & 3 rooms with bunk beds. 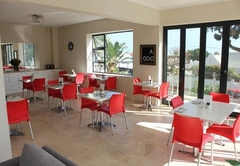 Each room has a flat screen TV with Netflix & Free Wi-Fi. 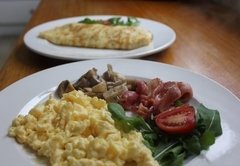 Shared, unisex bathroom facilities with 3 toilets & 3 shower serviced daily. 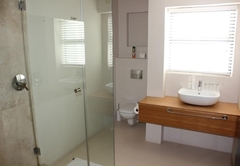 3 Beds with 1 en-suite Bath & shower & a 2nd separate bathroom with (Shower over bath). 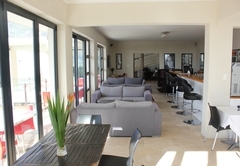 Huge & spacious open plan kitchen, lounge & dining area, opening out onto a huge patio, overlooking the pool with sea views. 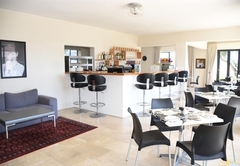 Self-catering 2 beds apartments, open plan lounge & kitchen area. 1 apartment has a Shower over bath while the other 2 have a Separate bathroom with bath & shower. 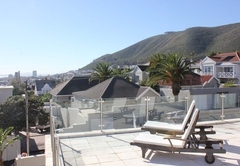 Front balcony sea views, back terrace Lions Head. 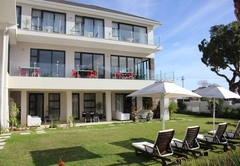 Spacious, self-catering open plan apartment consisting of 2 double beds on a raised area, with fully equipped kitchen. Separate bathroom with shower and dressing area. Large terrace with sea views. This room has a double bed with an En-suite shower & is close to the reception area with the parking bays outside which can be a bit noisy at times. Recommended for single /couples who enjoy the nightlife / been out till late. Includes Free WiFi and Netflx. 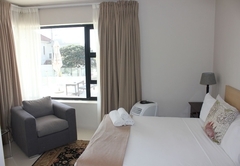 This spacious room has a double bed with a separate shower just outside the hotel close to the backpacker's section. The sliding doors open out onto the parking bays outside. Small area with mini fridge, microwave and kitchen table. Includes free WiFi. 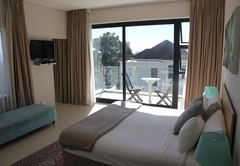 Spacious Self-catering 1 bedroom apartment, open plan lounge & kitchen area with a separate shower & a double bed with a small garden area in front. Free WiFi and Netflix. Definitely not as nice as their website conveys it to be. I thought it would be a bit of a spoil for my partner's birthday but was disappointed. Not nearly as luxurious as it appears. Aircon and TV didn't work. No wellness spa like it says on website. I had to prove that I had paid twice as they didn't update their records. Overall - underwhelmed. What a wonderfully unexpected find! The room was great and the staff were very helpful with all our requests. They pointed us in all the right directions so that our first trip to Cape Town is now causing me to book our next :) Thanks guys & see you in December! 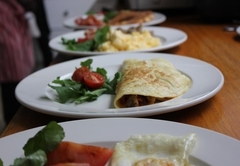 Response timeGrande Kloof Boutique Hotel typically responds to requests in 5-10 minutes. Grande Kloof Boutique Hotel has got a storage area for guests that wish to store their luggage after check-out, please enquire.